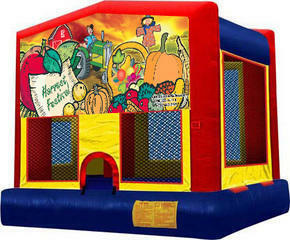 Autumn Harvest Themed 15x15 Moonwalk Jump bounce castle 15'4" x 14'4" Rental, delivery, set-up, take down, and return. This is a large sized unit. Includes stakes and/or sandbags containers (sand has additional charge) for anchoring unit, ground cover and entry/exit mats. Also includes 100' lighted electric cord and GFCI cord. Renter must complete RentalSafety.com online training program for safety supervision.